I'm excited to share with you breaking news from California: a federal appeals court has upheld Prop 2, California's new law banning the inhumane confinement of egg-laying hens, breeding pigs, and veal calves in cages so small the animals cannot stretch their limbs, lie down, or turn around. The court rejected an egg producer's argument that Prop 2 is vague, ruling that any "person of reasonable intelligence" could understand the law. This is the fifth court ruling favoring the proponents of Prop 2 and its companion law, AB 1437, which bans the sale of eggs in California from hens kept in such inhumane conditions. Previously, the district court had upheld Prop 2 in this same case, ruling that it "does not require the investigative acumen of Columbo" to apply the standards. And last October a federal district court rejected a challenge to AB 1437 from six large agribusiness states, finding that the states were improperly suing on behalf of private special interests. With today's ruling from the U.S. Court of Appeals for the Ninth Circuit, it's time for retailers and egg producers to stop litigating, and start complying with the law. Prop 2 imposes clear animal welfare and food safety requirements, requiring plainly that hens have enough space to perform basic natural behaviors. We've said from the start that the only economically viable systems to allow these performance standards for hens are cage-free ones. Many companies, including Trader Joe's, are almost certainly selling eggs from hens in cages, and that violates the law. In our first-ever press release about Prop 2, when we launched the campaign in October 2007, we wrote that the law "will prevent the use of inhumane factory farming practices such as ... battery cages for egg-laying hens." Our opponents acknowledged this, citing a University of California economic analysis that assumed Prop 2 "would eliminate the use of cage systems for laying hens in California," and writing after our victory that "[c]ages for laying hens ... will certainly be outlawed." Californian voters and legislators overwhelmingly voted to end battery cage confinement. In fact, almost two thirds of Californians voted for Prop 2-amassing more votes than any other citizen-led ballot measure in American history at that time-even after our opponents claimed in the state's official voting guide that Prop 2 would "forc[e] hens outdoors for most of the day." And Governor Schwarzenegger signed AB 1437, which passed with bipartisan votes of 65 to 9 in the assembly and 23 to 7 in the state senate even after we made clear that "one effect of Prop 2 is to halt the use of cage systems that are commercially viable." But some egg producers and retailers – who spent the six-year phase-in period fighting in court instead of preparing to implement the new standards – have now claimed that they don't need to provide hens with that much space. Instead, they're claiming that compliance with an unrelated California Department of Food and Agriculture (CDFA) regulation is sufficient. It's not. As today's ruling makes clear, Prop 2 and AB 1437 require hens to have enough space to turn around, lie down, and fully spread their wings. 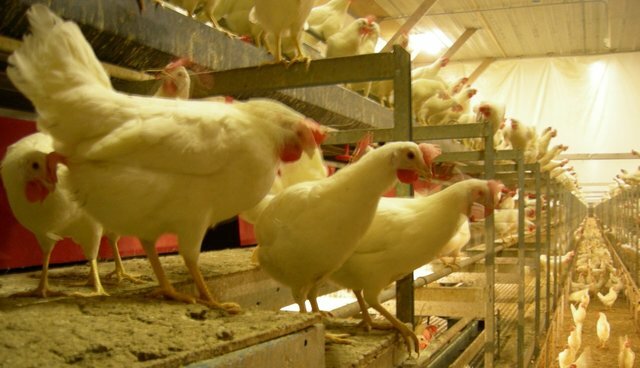 The CDFA regulations, which require 116 square inches of cage space per bird and are a definite improvement over conventional production methods, still don't provide birds with enough space to fulfil Prop 2's wing-spreading requirement. The California regulation is an egg safety standard, and not a humane standard. By buying caged eggs that only meet the CDFA egg safety standards, many California retailers are openly flouting AB 1437. In the coming months, we'll be working to ensure 100 percent compliance with the new law Thankfully, many egg producers are converting to or expanding their existing cage-free production to meet the consumer demand for higher welfare eggs. And major food companies-including food service giants Aramark, Compass Group, and Sodexo-have already converted to 100 percent cage-free shell eggs in their California operations to comply with the laws. Others-from Burger King to Starbucks and Unilever (Best Foods/Hellmann's)-are going cage-free nationally. The laggards need to catch up. Today's ruling makes absolutely clear that the future in California is cage-free.